This story originally appeared in a January issue of Strip-Till Strategies and is re-posted with permission. Over the five generations the Delhotal family has farmed in West Brooklyn, Ill., it’s been important for them to produce high quality crops while caring for the land in an environmentally sustainable way. The father and son team of Ray and Dave Delhotal have spent the last few years taking aggressive strides toward those goals by adopting a two-pass strip-till system, as well as precision technology and a controlled-traffic system. In addition to the savings, they’ve also seen some yield advantages moving to strip-till. Part of the push behind the switch from primarily conventional tillage to strip-till came when the Delhotals realized how healthy the soil was in the small portion of their operation where they used to no-till. However, issues that they faced with their no-tilled corn, such as cold soils in the spring and reduced stands, dissuaded them from implementing the practice on a larger scale. But Dave adds that they couldn’t deny how much they preferred the simplicity, increased soil health and biological activity of a no-till system, and that, coupled with their increasing difficulties with conventional tillage, eventually spurred a change. Their first attempt at strip-till was with a homemade shank-type machine in the fall of 2009, which fell short of their expectations. They felt that the shanks were smearing their soil, and they often ran up against rocks as well. 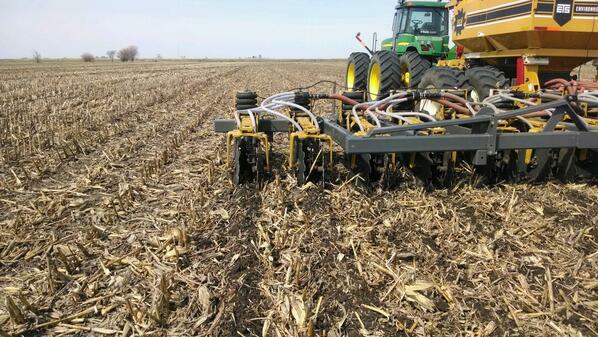 Currently, the Delhotals run a coulter setup on a 16-row SoilWarrior strip-till rig from Environmental Tillage Systems. “We have quite a few rocks, and the big cogs on the row units will just roll right over them and never bring them up,” Dave says. “We’re also able to literally run minutes behind the combine. The Delhotals have preferred splitting their fertilizer application, applying about ¾ of the crops’ needs of potash and monoammonium phosphate (MAP) in the fall strips, 10 to 12 inches deep, and then the remaining phosphorus and potassium with urea in the spring during a strip-refreshing pass with the SoilWarrior. 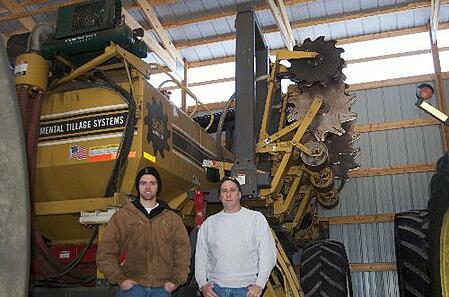 Last spring, the Delhotals experimented with a pre-plant sidedress application of 32% nitrogen using a Fast Mfg. nitrogen applicator. They applied roughly 1/3 of the total N needed this way, 4 inches deep and 7 inches to the side of the strip. The experiment worked well, and Dave noted that in a few check strips that the corn sidedressed pre-plant was one or two collars ahead in most places during the early growing season. However, this spring, they plan on applying Environmentally Smart Nitrogen (ESN) with the spring strip-till pass and banding the nutrients 5 inches deep in the 10-inch-wide strips. One of the concerns Dave has about the repeating the pre-plant application is the potential for burn in the root zone ahead of planting. “We’ll have the option with ESN, so we’ll really up the rate of nitrogen in the strips without having to worry about burn. So, we’ll be able to eliminate the pre-plant nitrogen pass.” he says. Based on the increased accuracy and placement they feel they’re getting with strip-till, they’re hoping to scale back application rates of most of their fertilizer in the future. Dave says using a two-pass system with the SoilWarrior also helps them deal with tough clays soils and compaction problems. As soil health improves with strip-till, Dave says he may consider switching to a one-pass system in the spring on the majority of their ground. But for now, they prefer a two-pass system to get rid of all the compaction from years of conventional tillage. Strip-till has helped them solve some of their compaction problems, but Dave says they wanted to take it a step further with a controlled-traffic system. With some careful planning, they have already seen results. The Delhotals also switched from dual tires to single 710s with a lower PSI on their planter tractor because they were having pinch row problems that hurt yield. Dave says that he wouldn’t doubt that the duals were costing him about 10 bushels of corn per acre. Plotting an accurate path through the field is essential to the success of the Delhotal’s strip-till system. They use Trimble’s TruTracker active implement guidance system on their strip-till rig, run through the FMX receiver in their John Deere tractor, which is guided by a DigiFarm RTK correction signal. Implement guidance was a substantial investment, but one which is paying off — especially in fuel savings. In fact, the Delhotals had a convenient barometer for their early success. They were able to measure the amount of fuel they were using directly against some custom work they were doing for nearby farm managers. Read about how more of our customers are defending the land with the SoilWarrior and download our ebook to learn more about Zone Tillage.